A new law that has been signed this spring will mean more help available for Iowa veteran and their families through the Iowa Veterans Trust Fund. If you'd like information about how to apply for assistance through the Trust Fund, click here to visit the benefits page at the Iowa Department of Veterans Affairs. With our latest transfer completed, the lottery has now raised nearly $25 million for the Iowa Veterans Trust Fund since we began providing money to that cause back in 2008. This past weekend, we all observed Veterans Day to honor and remember the service of our nation’s veterans. Here at the Iowa Lottery, this time of year it also calls to mind the proceeds we’ve been able to raise to help Iowa veterans and their families. At the end of October, we made the lottery’s $2.5 million annual transfer to the Veterans Trust Fund for the current fiscal year. And that brings the grand total that we’ve raised for the cause to $24.9 million. Today, a portion of the proceeds from the sale of all Iowa Lottery games is dedicated to the Veterans Trust Fund. If you’re looking for more information about the Trust Fund or how to apply for assistance from it, visit the Iowa Department of Veterans Affairs website. Click on the “Benefits” tab at the top of that page to learn more. Iowa Lottery Players Now Have Won More Than $3.8 Billion! Somewhere in Iowa, a lottery player has claimed a prize that pushed things past a significant historical threshold. Since the Iowa Lottery’s start back in 1985, lottery players who bought their tickets in Iowa now have won a total of more than $3.8 billion in prizes. And while we join you in saying, “Wow! Holy cow!” about the new milestone, we also offer our thanks to everyone who has bought a ticket. We do our best to keep things fresh and fun, and we’re glad you’ve enjoyed our products through the years. We’ve not sure exactly which prize it was that lifted the winnings total past the $3.8 billion mark, but it sure is fun to see that number continue to climb! Now, if you’re not a big winner yet, we know you likely won’t be satisfied until you see YOUR NAME on a big check. But we hope you can join in the celebration for now of this big number! The other number that holds huge meaning for us is the total in lottery help to state causes. That proceeds total is currently at more than $1.7 billion, but it also is growing, so maybe we’ll see a new threshold on that side soon, too. Thanksgiving Travel: Can I Claim A Ticket From Another State In Iowa? If you buy a lottery ticket in Iowa, you’ll need to claim any prize you win from that ticket here in Iowa. And if you buy a ticket in another state, you’ll need to claim any prize from it in that state. As we’ve discussed many times here on the blog, there’s a lot of technology that goes into running a lottery today, and each state lottery has its own computer system to track the tickets it sells. The lottery terminals that sell and cash lottery tickets at retail locations here in Iowa are connected to a central communications system that spans our entire state. That lottery network provides real-time information about retail transactions involving millions of tickets. The same is true in any other U.S. state that has a lottery. And, the money raised from the sale of lottery tickets in each state stays in that state to support valuable causes there. Because each state lottery individually tracks its tickets and $$$$$, the computer systems involved are independent. So that means our equipment here in Iowa can’t read tickets from out of state, and vice versa. Have a Happy Thanksgiving, everyone! Travel safely. Remember that our offices will be closed tomorrow and Friday for the long holiday weekend. So, we’ll see you again on Monday, Nov. 28! Player Mail: What’s Up With Those ‘Lottery Trucks’? Great question, Lynn, and thanks for being an observant player! We worked with the Iowa Alcoholic Beverages Division to design signs for those trucks. The trucks deliver liquor to retail outlets across Iowa where it is sold. Because the trucks are out and about all over Iowa, ABD asked us if we would like to add lottery advertising to the trailers to highlight our products and how lottery proceeds help the state. We have three different designs on ABD trucks: one that advertises Powerball and Mega Millions; another that focuses on the Lucky for Life game; and a third that highlights the proceeds that the lottery raises each year to help our state’s veterans and their families through the Iowa Veterans Trust Fund. Now you’ll be in the know if you see one of the trucks in your community! More Than $22 Million Raised For Iowa Veterans Trust Fund! With our latest transfer of $2.5 million, the lottery has now raised more than $22.3 million for the Iowa Veterans Trust Fund since the lottery began providing money to that cause back in 2008. With the observance of Veterans Day on Nov. 11, it’s a time for each of us to honor and remember the service of our nation’s veterans. Here at the Iowa Lottery, this is also a time that we’re especially thankful and proud of the proceeds we’ve been able to raise to help Iowa veterans and their families. This week, we made the lottery’s $2.5 million annual transfer to the Veterans Trust Fund for the current fiscal year. And that brings the grand total that we’ve raised for the cause to more than $22 million. Today, a portion of the proceeds from the sale of all Iowa Lottery games is dedicated to the Veterans Trust Fund. All that hub-bub over last month’s world-record Powerball® jackpot has led to some big lottery numbers here in our state. The Iowa Lottery smashed several long-standing records in January. Our financial figures for January are out today, showing that the lottery set records for its highest monthly sales, highest monthly proceeds to state causes and highest monthly prizes to players since its start in 1985. The Jan. 13 Powerball drawing was a historic moment, and we thank our players and retailers for being part of it with us. It was definitely a busy time, but we had a lot of fun, too. And our joint efforts have made a big difference right here at home by raising additional lottery proceeds for state causes while at the same time bringing a record amount in prizes to players. The Powerball jackpot grew for more than two months before it reached a world-record level of nearly $1.6 billion annuity ($983.5 million lump-sum option) and was split in the Jan. 13 drawing by three tickets purchased in California, Florida and Tennessee. During that jackpot run from Nov. 5, 2015, to Jan. 13, 2016, the Iowa Lottery sold about $34.2 million in Powerball tickets. That compares to a total of $52.2 million in Powerball sales in all of fiscal year 2015. With the world-record jackpot drawing occurring in January, total monthly sales for the Iowa Lottery hit $54.1 million, topping the previous monthly sales record of $42.2 million set in February 2006. Monthly lottery proceeds to state causes also were a record, totaling $17.3 million. The previous monthly proceeds total of $11.6 million had stood since February 2006. During the course of the month, the lottery also saw its highest Powerball sales for one day ($6.3 million on Jan. 13), its biggest sales week ($19.5 million for the week ending Jan. 9), and its highest monthly sales for instant-scratch tickets ($20.8 million). We know that things will continue to fluctuate in the months ahead, but the lottery is well positioned to meet its budget targets for the year, with sales and proceeds through January both ahead of budget and the lottery’s five-year average. Our strong performance last month also sent total prizes to players past a historic mark. Since the Iowa Lottery’s start in 1985, players have now won more than $3.6 billion in prizes while the lottery has raised more than $1.6 billion for state causes. Yesterday was Veterans Day at the Capitol here in Iowa, and there was a huge crowd of veterans at the Statehouse! The lottery had a booth there to provide information about the proceeds that we raise for the Iowa Veterans Trust Fund. And we added to the fun of the day by giving some lottery prize packs away in contests we held at our booth. Here are shots of some of the lucky contest winners! We hope they have fun playing the scratch tickets in their prize packs and enjoy the lottery swag we included, too. Since 2008, the Iowa Lottery has raised nearly $20 million for the Veterans Trust Fund to help Iowa veterans and their families. We proud to be able to help such a noble cause and truly mean it when we say: Thank you, veterans, for your service! That Veterans Total Keeps Climbing! Many thanks to the Iowa Energy, which gave us the chance to be part of the team’s Military Appreciation Night this month. We got to do a center-court presentation to call attention to the grand total in lottery proceeds raised so far for the Iowa Veterans Trust Fund (IVTF)! I'm shown here with Colonel Bob King, Executive Director of the Iowa Department of Veterans Affairs and Director of the Iowa Veterans Cemetery. Colonel King served in the Iowa National Guard for nearly 36 years prior to his September 2004 retirement. He got the ceremonial check showing that the lottery has raised nearly $20 million since 2008 to help Iowa veterans and their families through the IVTF. The precise total with our transfer for fiscal year 2016, which we made to the Trust Fund in late October, is $19,852,121. As we prepare to observe the Veterans Day holiday tomorrow, it’s a time for each of us to honor and remember the service of our nation’s veterans. Here at the Iowa Lottery, this is also a time that we’re especially thankful and proud of the proceeds we’ve been able to raise to help Iowa veterans and their families. And we just upped the grand total. Back in June, I blogged about the change taking effect in the way the lottery raises proceeds for the Iowa Veterans Trust Fund, and the positive impact that would have on the resources dedicated to that cause. Late last month, we made the lottery’s $2.5 million transfer to the Veterans Trust Fund for the current fiscal year. And that brings the grand total that we’ve raised for the cause to nearly $20 million! Today, a portion of the proceeds from the sale of all Iowa Lottery games is dedicated to the Veterans Trust Fund. If you’re looking for more information about the Trust Fund or how to apply for assistance from it, click here to visit the website of the Iowa Department of Veterans Affairs. Click on the “Benefits” link at the top of that page to learn more. The lottery’s office will be closed tomorrow in observance of Veterans Day, and we’ll be back to work on Thursday. So How Is The Lottery Doing? It’s that time of year when we report how the lottery is doing as a business. The short answer is that we’re doing well – the past year was a good one. Sales of scratch tickets here in Iowa set a record in fiscal year 2015, which ended June 30. The lottery achieved overall annual results among the Top 4 in its 30-year history, and the purchase and move of our headquarters location also was completed on time and under budget in the past year. Lottery sales have topped the $300 million mark for the fourth straight year and proceeds to state causes and prizes to players also were among the lottery’s best. So what’s behind the numbers? We’ve put a lot of effort into diversifying our product mix and keeping a variety of games on the market to give customers choices. It’s our job to take care of the behind-the-scenes work so you as our players can just have fun and dream a little. Our preliminary figures are out today. They show that lottery sales in FY 2015 totaled nearly $325 million. Proceeds to state causes totaled $74.5 million, the fourth-highest amount for the lottery since its start in 1985. Prizes to players totaled nearly $197 million, the second-highest total in the lottery’s history, and nearly a $10 million increase from the previous year. All told, sales from our core products – lotto games, scratch games and pull-tab games – totaled $324.8 million. That’s up about 3.4 percent from the previous year. In particular, sales of scratch tickets set a record this past year at nearly $212 million. The previous record for scratch sales was $202.3 million back in FY 2013. Another important figure for us is the support we give to local businesses in the form of sales commissions for selling the lottery’s products. We’re proud to say that the total in lottery commissions to business across the state was nearly $21 million in FY 2015. And now for the grand totals: Since the lottery’s start 30 years ago, players have won more than $3.5 billion in prizes while the lottery has raised more than $1.6 billion for the state programs that benefit us all. On Wednesday, a new state law will take effect that’s designed to stabilize the amount raised by the lottery each year to help Iowa veterans and their families. The Iowa Lottery requested the change, which I first blogged about this spring after Gov. Terry Branstad signed the proposal into law. Since 2008, the proceeds from the sale of two scratch games and two pull-tab games each year have been dedicated to the Iowa Veterans Trust Fund. But annual proceeds to the IVTF have been on the decline for the past few years. In FY 2014, for the first time since the lottery started raising money for the cause, we didn’t reach our publicly stated goal of providing between $2 million and $3 million to the IVTF. (The annual total that year was $1.8 million.) We think there’s a main reason for that decline. While overall lottery sales and proceeds have repeatedly exceeded budget projections, we’ve seen a long-term decline in the sale of our pull-tab games. Pull-tabs have been closely tied to our efforts to help the Veterans Trust Fund, making up half the games for that cause. And if pull-tab sales kept falling, that would pull down our efforts to support the IVTF. The law that takes effect on Wednesday will eliminate a certain number of lottery games each year dedicated to the cause and instead allocate $2.5 million in lottery proceeds annually to the IVTF. That’s the midway point of our publicly stated goal for the project and also is the yearly average of the total we’ve raised so far. Under current law, the majority of lottery proceeds each year go into the state General Fund, where they help pay for the variety of programs that receive money through it. A smaller portion of lottery proceeds goes to the Veterans Trust Fund. That will continue to be the case under the new law, it’s just that the way we raise money for the IVTF will be changed, with $2.5 million in lottery proceeds going to that cause each year. As of next week, a portion of the proceeds from the sale of all Iowa Lottery games will be dedicated to the Veterans Trust Fund. We’ll of course continue to spread the word about the Veterans Trust Fund and the help it provides to Iowa veterans and their families. And I’m sure we’ll still sell patriotic-themed games from time to time. We did that even before we started helping the IVTF and they’ve always been popular. We’re gratified to announce some important upcoming changes in the help that the Iowa Lottery provides for the Iowa Veterans Trust Fund. A proposal from the lottery has been signed into law by Gov. Terry Branstad. The legislation will stabilize the proceeds that the lottery raises each year to help our state’s veterans and their families through the IVTF. Senate File 323 will take effect July 1 and will mean changes in the line-up of games that the lottery offers in retail locations – changes designed to ensure a stable, ongoing source of revenues for the IVTF. The proposal was approved March 9 in the Iowa Senate and March 10 in the Iowa House before being signed into law Tuesday. You’ve likely heard me reference before that the lottery has raised proceeds for the IVTF since 2008. I’m proud to report that through February of this year, we’ve provided a total of more than $17 million to this worthy cause. Under current law, the proceeds from the sale of two scratch games and two pull-tab games each year are dedicated to the Veterans Trust Fund. But annual proceeds to the IVTF have been on the decline for the past few years. In FY 2014, for the first time since the lottery started raising money for the cause, we didn’t reach our publicly stated goal of providing between $2 million and $3 million for the IVTF. (The annual total from the lottery for the Trust Fund in FY 2014 was $1.8 million.) There’s one main reason for the recent decline. While overall lottery sales and proceeds in recent years have been strong and repeatedly exceeded budget projections, the lottery is seeing a long-term decline in the sale of its pull-tab games. Right now, pull-tabs are closely tied to the lottery’s efforts to help the Veterans Trust Fund, making up 50 percent of the games dedicated to the cause. A continued decline in pull-tab sales would negatively impact the lottery’s ability to support the IVTF. To stabilize ongoing proceeds to the Veterans Trust Fund, the legislation we introduced will eliminate the requirement for a certain number of lottery games each year dedicated to the cause and instead allocate $2.5 million in lottery proceeds annually to the IVTF. That amount is the midway point of the lottery’s publicly stated goal for the project and also is the yearly average of the total we’ve raised so far. Under current law, the majority of lottery proceeds are dedicated each year to the state General Fund, where they help pay for the variety of programs that receive funding through it; with a smaller portion of lottery proceeds dedicated to the Veterans Trust Fund. That will continue to be the case with the change in law on July 1 – it’s just that the method by which the lottery raises money for the IVTF will be changed to $2.5 million in lottery proceeds being dedicated to the cause each year. As of July 1, a portion of the proceeds from the sale of all lottery games will be dedicated to the Veterans Trust Fund. The set of games we introduced in January that provide 100 percent of their proceeds to the IVTF will be the last in that series that we’ll release. We’ll of course continue to spread the word about the Veterans Trust Fund and the help it provides to Iowa veterans and their families. And we’ll also offer patriotic-themed games over time – we did that even before the lottery started helping the IVTF and those games have always been popular. Mother Nature definitely threw some nasty stuff at us all this past winter, but it’s still ended up being a strong year for the Iowa Lottery. Our fiscal year 2014 results are out today, and the lottery’s annual sales, proceeds to state causes, and prizes to players all rank among the Top 4 in our 29-year history. The preliminary figures show that lottery sales in FY 2014 totaled more than $314 million, marking the third year in a row that the total has topped the $300 million mark. Proceeds to state causes totaled nearly $74 million, the fourth-highest amount for the lottery since its start in 1985. Prizes to lottery players totaled $186.9 million in FY 14, the second-highest total in the lottery’s history. • Mother Nature. Who can forget the blizzards and frigid temperatures this past winter? The weather often made it impossible for folks to get out and about here in Iowa, and when people aren’t in their normal routines, they don’t make their usual purchases, including lottery tickets. The winter weather definitely impacted lottery sales. • Cyclical Powerball jackpots. The lottery’s FY 2013 results got a big lift from strong Powerball sales, with the game’s jackpot topping the $300 million mark four different times that year. FY 2014 saw the Powerball jackpot top that mark only three times, which impacted that product’s overall sales in Iowa. As you’ve heard us say before, big jackpot runs can’t be predicted, and that’s why we know the lottery has to carefully budget for results that reliably can be achieved. Statistically, we know that our results will fluctuate from year to year, but we anticipate that lottery games will continue to be a consistent, key source of proceeds for vital state causes here in Iowa. Here are some other highlights from FY 2014: With our players’ help, we were able to raise $1.8 million for the Iowa Veterans Trust Fund to benefit our state’s veterans and their families. The lottery has now raised more than $15 million for the Trust Fund since we began providing proceeds to that cause in 2008. And local Iowa businesses received $20.1 million in commissions from the lottery for selling our products in FY 2014. Our retailers are the front lines when it comes to selling our tickets and we’re glad to know that lottery commissions make a positive difference in the bottom line for businesses across the state. The latest results are in, and they show that the lottery raised a record $68 million for state causes during its latest financial year. That number includes more than $3 million to benefit Iowa veterans and their families. We released preliminary figures today showing that lottery sales totaled $271.4 million in fiscal year 2011, which ended June 30. That marks the highest combined sales total from lotto, instant-scratch and pull-tab games since the lottery’s start in 1985. And we can’t forget about lottery players! They took home a historic $159 million in prizes from those core games. That’s a 5.6 percent increase from the previous record prize total from those products set just a year earlier. Each year, we concentrate on bringing new and exciting ideas to the market while keeping an eye on results. The past fiscal year saw Iowa Lottery players get into our promotions in record numbers, and at the same time, they won eight prizes of at least $1 million in our games. Another huge highlight for us is the $3.1 million that the lottery raised for the Iowa Veterans Trust Fund to benefit our state’s veterans and their families. That’s the highest total for the cause since proceeds from select lottery games were first dedicated to the Veterans Trust Fund in 2008. It’s also the first time that annual lottery proceeds for veterans’ causes have topped $3 million. Iowans are definitely committed to the cause! And finally, another side of the lottery’s success is the positive impact we have on businesses’ bottom line. Iowa businesses received $17.3 million in commissions from the lottery for their daily work in selling lottery products in FY 2011. That’s a $1.2 million increase from the year before. Since the lottery’s start in 1985, its players have won more than $2.7 billion in prizes while the lottery has raised more than $1.3 billion for the state programs that benefit all Iowans. Today, lottery proceeds in Iowa have three main purposes: They provide support for veterans, help for a variety of significant projects through the state General Fund, and backing for the Vision Iowa program, which was implemented to create tourism destinations and community attractions in the state and build and repair schools. You can officially say it’s been a very good year for the sale of instant-scratch games, the Iowa Lottery’s perennial sales leader. Preliminary figures show that scratch-game sales in Iowa totaled $16.1 million in March, the highest monthly sales total for that product category in the lottery’s history. Scratch tickets were the first product introduced by the Iowa Lottery when it started in 1985 and have been one of its top-selling items in all the years since. The March sales total for scratch games tops the previous monthly high for that product category of $14.7 million, which had been set in January. And January’s figure had topped the previous record set in November, which in turn had topped the previous high established in March 2010. Lottery retailers also figure prominently into the mix. They’re the day-to-day face of the lottery and are the folks interacting with customers and selling tickets. The help the lottery provides to worthy causes here in Iowa also is a big part of the picture. When you play the lottery, the benefits extend beyond the prize you may win. Scratch games accounted for 56 percent of the lottery’s record sales of $256.3 million in fiscal year 2010, which ended June 30. And, scratch-game sales are helping to drive the lottery’s continued strong performance in the current financial year. Total lottery sales through March are running ahead of 2010’s pace. The outlook is not entirely rosy, however. Fuel prices have always been something that impacts lottery sales, so we’re watching today’s rising prices closely. If the current trend continues, the high prices likely will put a damper on Iowa Lottery sales (along with the sales of a whole lot of other things, too). And just where does the money raised from the sale of lottery tickets go in Iowa? Today, lottery proceeds in Iowa have three main purposes: They provide support for veterans, help for a variety of significant projects through the state General Fund, and backing for the Vision Iowa program, which was implemented to create tourism destinations and community attractions in the state and build and repair schools. When Are Lottery Sales Higher? We like to say that you can tell the seasons by lottery sales! Each year, there’s a general cycle here in Iowa: Lottery sales are strong in the fall and winter and through early spring. In late spring and throughout the summer, lottery sales dip a bit. Why? In the late spring and summer, people aren’t in their regular routines. They’re on vacation, they’re traveling, and they’re outside having fun. People buy lottery tickets when they’re running errands of part of their regular routines, and that gets interrupted a bit in the late spring and summer. But it always comes back when we head into fall. In just a year and a half, the Iowa Lottery has raised nearly $4 million to help Iowa veterans and their families, and we owe you a big thank-you for that success! Gov. Chet Culver signed a law in March 2008 that authorized the lottery to create two new instant-scratch games and two additional pull-tab games each year, with all profits from the games dedicated to the Iowa Veterans Trust Fund. Lottery tickets for the cause were introduced in July 2008 and since that time, nearly $4 million has been provided to the Veterans Trust Fund from the sale of tickets. The newest scratch game dedicated to the cause is “Veterans Cash,” which began sales Monday, while the newest pull-tab game to benefit the Trust Fund is “Star Spangled Bucks.” It was introduced on Jan. 11. Both are $1 games with a red, white and blue theme. The Iowa Veterans Trust Fund was created to provide assistance to qualified veterans and their families. Currently, funds are used for unemployment or underemployment assistance due to service-related causes; assistance with vision, hearing, and dental care, durable medical equipment and prescription drugs; counseling and substance abuse services; housing repair; and transitional housing in an emergency. Trust Fund expenditures are approved through the Iowa Veterans Commission. How’s It Going, Iowa Lottery? We thought you’d never ask! And actually, we have some good news to share. The lottery just made its final proceeds transfer to the state for fiscal year 2009, and our total was up more than 7 percent from a year earlier. Our preliminary figures show that lottery proceeds to the state in FY 2009 totaled more than $60.6 million. That’s the highest profits total from the sale of lotto, instant-scratch and pull-tab games since the lottery’s start in 1985. And that’s even with lottery sales being down a little for the year. Lottery sales totaled $243.3 million in FY 2009, down 2.4 percent from a year earlier. So how can our numbers match up? It has to do with the success you can achieve with business flexibility. In 2003, the lottery “got a makeover,” changing from being a state agency into the Iowa Lottery Authority, a corporate-model lottery that focuses on entrepreneurialism. That new flexibility has allowed us to make some important changes that have saved money. In 2004, the lottery purchased both its headquarters building in Des Moines and the vending machines it currently uses to sell instant-scratch and pull-tab tickets in retail locations across the state. That’s resulted in long-term savings to the state, including a big change this year as the payments on the bonds we’d issued to buy the building and machines decreased from $2 million to $100,000. We’re glad that our changes are making a difference for our state’s budget, especially in these tough economic times. Another important project that’s made a big impact on the lottery are our games that benefit the Iowa Veterans Trust Fund. Legislation dedicating some lottery proceeds to veterans’ causes was signed into law by Governor Culver in March 2008. The Lottery’s first games to benefit the Veterans Trust Fund began sales in July 2008 and we’ll continue to create two new instant-scratch and two additional pull-tab games each year, with the proceeds from those games dedicated to the Trust Fund. When we’d initially talked about the games, we’d estimated that they could raise between $2 million and $3 million annually to help Iowa veterans and their families through the Trust Fund. Well, we hit the very upper end of that range in FY 2009, raising nearly $2.8 million for the Iowa Veterans Trust Fund. Our thanks go out to lottery players for recognizing this important cause and helping the lottery provide a stable, ongoing source of revenue for the Iowa Veterans Trust Fund! Catch the Lottery's latest TV ad, and you'll see the faces of some true Iowa heroes. They're all veterans who have served our country and now have received some much-deserved assistance from the Iowa Veterans Trust Fund. 1. to call attention to the Iowa Veterans Trust Fund and the help it offers to veterans. 2. to remind everyone that the Iowa Lottery has instant-scratch and pull-tab games available that specifically benefit the Veterans Trust Fund, with 100 percent of the proceeds from those games going into the Trust Fund. The TV ad features images of veterans who have received assistance through the Iowa Veterans Trust Fund and agreed to be part of the campaign to help spread the word about the help that's available. You’ll see veterans from across the state and from several different eras in the ad -- maybe even someone you know! Click here for a sneak peek! We’re very proud that we’ve been able to raise more than $1.4 million so far for the Iowa Veterans Trust Fund. We're right on track to meet our projections that we’ll raise between $2 million and $3 million this year for the Trust Fund. Thank you for the role you've played in that success! Those of us at the Iowa Lottery owe our players a huge thank you for helping us achieve success in our new initiative that helps Iowa veterans and their families. In July, the lottery began to sell games that raise money for the Iowa Veterans Trust Fund. We just made our latest transfer to the Veterans Trust Fund, and I'm incredibly pleased to tell you that we've provided more than $1.4 million to directly benefit veterans so far this fiscal year. Last month, I blogged about the lottery’s newest games to benefit the cause. Next time you're in a store that sells lottery tickets, look for the $1 "Freedom Rings" instant-scratch game and the $1 "Land of Liberty" pull-tab game. And in each fiscal year going forward, we’ll have another four games to benefit veterans. We are right on track to meet our original estimates, which were that we'll raise between $2 million and $3 million for veterans this year. Thank you for all you have done to help the lottery ensure a stable, ongoing source of revenue to help our veterans! The Iowa Veterans Trust Fund was created to assist qualified veterans in paying for some of their expenses. To learn more about the Veterans Trust Fund, visit www.iowava.org. Reports are coming in from around the country showing that lottery sales are slowing in many areas as folks tighten up their spending in today’s tumultuous economic times. Click here, here and here to read the latest about lottery sales in a few other states. In Iowa, we’re seeing much of the same, but things here also continue to be impacted by the weather-related disasters that devastated much of the state earlier this year. In the Iowa Lottery’s year-end report in July for fiscal year 2008, we noted that sales of lottery tickets had begun to be impacted by increasing fuel prices and weather-related disasters. Lottery sales in FY 2008 finished up overall, but that was because they had jumped out to a strong start early in the year. As the fiscal year continued, lottery sales had slackened. That trend has continued into the current fiscal year. Our early figures show that Iowa Lottery sales in FY 2009 are down about 6 percent (about $4.2 million according to our raw sales figures through Oct. 18) compared to the same time period a year ago. We believe that’s perfectly understandable when you consider the impacts that many areas of the state continue to feel from this year’s storms and flooding. Iowans, along with people around the world, also are undoubtedly concerned about economic issues. Consumers have cut back in their discretionary spending for everything from eating out to buying new cars to purchasing lottery tickets and other convenience items. 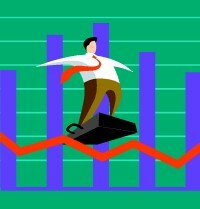 Now, a lot could change before the June 30th end of the current fiscal year. We’ll continue to do the creative things we’ve always done at the lottery, whether that be coming up with new game designs and ideas, offering new promotions or using creative advertising. But we also understand that Iowans are having to make some sensible decisions with their money during these times and we not only would expect that, we encourage it. I am so proud to tell you that today, the Iowa Lottery is sending nearly $1 million to the Iowa Veterans Trust Fund. It’s the lottery’s first transfer of proceeds to the fund, which directly benefits our state’s veterans and their families. Last month, I blogged about the lottery’s new initiative to support veterans. The proceeds from an instant-scratch game (Stars & Stripes) and a pull-tab game (All American) already are dedicated to the Iowa Veterans Trust Fund, and we’ll come out with another set of games dedicated to veterans’ causes in January. And in each fiscal year going forward, we’ll have another four games to benefit veterans. Today, the lottery will transfer $992,772.81 to the Iowa Veterans Trust Fund. That’s the proceeds total from the sale of veterans-benefit lottery tickets during the first quarter of FY 2009. We anticipate we’ll raise between $2 million and $3 million for veterans this year. Thank you for all you have done to help us ensure a stable, ongoing source of revenue to help our veterans! And family and children support groups and honor guard reimbursement. 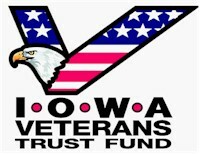 To learn more about the Veterans Trust Fund, visit www.iowava.org.